September 18, 2017  Stream the sweetly spooky return of the soft-hearted British psych-poppers. May 31, 2007  The band's quaint pop sound, as heard on "Winter on Victoria Street," recalls an era before psychedelic rock, earning comparisons to the boy-meets-girl love songs of the early to mid-'60s. 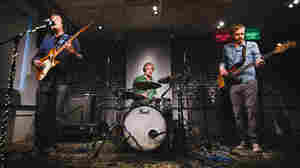 August 6, 2014  The British indie-pop band stops by WAMU in Washington, D.C., to play songs from 2000's recently reissued Suburban Light. Watch Alasdair MacLean and his crew perform "Reflections After Jane." June 5, 2007  Led by Alasdair MacLain's breathy vocals and smart lyrics, the London band The Clientele mixes psychedelic melodies and driving guitars into appealing indie-pop — a blend that's caught on quickly with American listeners. Hear an interview and in-studio performance by the band. May 7, 2007  The band mixes psychedelic melodies into appealing indie-pop, a blend that's caught on with fans. The group boosted its production values for God Save The Clientele, which singer Alasdair MacLean describes as "a lovely blend of Big Star twisted power-pop and country achin'." April 29, 2010  The Clientele has always evoked autumnal romps through the English countryside. 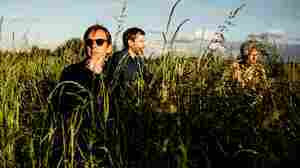 Led by Alasdair MacLean's warm voice, and now aided by the backing vocals and multi-instrumental skills of Mel Draisey, The Clientele performs its perfectly precise chamber-pop on World Cafe.